In a medium saucepan, fill it with water to half way up the pot and bring it to a boil over high heat. Once the water boils, toss in the green beans and remove the pan from the heat. Let the green beans sit in the hot water for 3-4 minutes. In the meantime, have an ice bath (iced water in a large bowl) ready. Carefully transfer the green beans into the ice bath to stop further cooking. Drain and dry with paper towels. Toss spinach, tomatoes, onion, basil, and green beans in a large bowl. Divide the salad among the plates and arrange the shrimp on top. Tomato-Basil dressing is recommended, but experiment with other MMC approved dressings as you like. 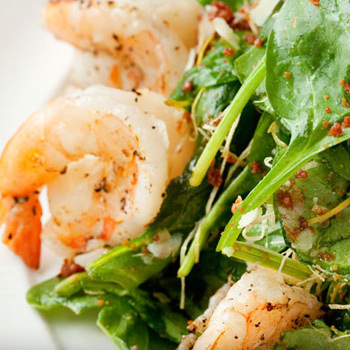 This entry was posted in Entrees, Modified Profast (Fast and Flexible) Recipes, Salad, Seafood, Vegetables and tagged Metabolic Medical Center Recipes, shrimp, side dish, spinach by foodies4mmc. Bookmark the permalink.